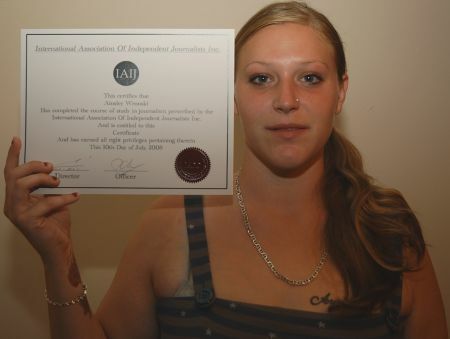 International Association Of Independent Journalists Inc. :: View topic - IAIJ Journalism Course And Diploma! Posted: Thu Jul 10, 2008 4:11 pm Post subject: IAIJ Journalism Course And Diploma! Ainsley Wronski's Certificate In Journalism! 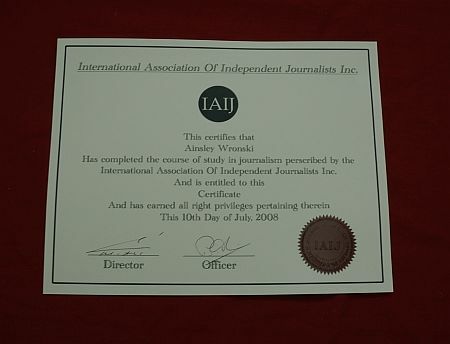 The International Association Of Independent Journalists Inc. - a not-for-profit corporation - has issued it's first group of certificates in journalism. The first certificate I had the pleasure to issue went to Ainsley Wronski, our Editor of the Fortress Newspaper. Ainsley had a hand in the content of the course material and as such she was the first to receive a certificate. Shane Murphy and Samantha Blackwell were the others in this group. Congratulations to all! The journalism course and diploma upon successful completion are available by contacting us at iaij@iaij.com with your request. We will then send you the course material to get you started. When you successfully finish the course we will issue you the diploma. Ainsley with her Certificate In Journalism! The diploma program is a series of projects that you must perform on your own using whatever tools you have and submit back to us. There is no time limitation. When all the activities have been completed we will go over them and judge the material as satisfactory for the diploma to be issued or worked on until that standard it met. This program is not Journalism 101 and we don't ask simple questions. The theory and short answers are covered everywhere on the Internet and books. We at IAIJ expect all our members to find those answers by themselves. This program is about getting out there and getting us news stories and information. The program also involves use of multi-media in reporting to reflect the changing face of news gathering. This is not an on-time test. This is a practical series of projects where you will learn journalism by doing. Our projects ensure the member actually goes out into the field and does real journalism from the source, which is real events in our everyday lives. If you would like to get involved in this diploma program, please contact us at iaij@iaij.com and give us your name and membership number and we will then enroll you in the program.